The entryway of your home will be the first impression your guests will have of your home. Finding the perfect floor cover is not only the best way to protect your floors, it is also a fun way to show your personality and instantly make your foyer look pulled together and organized. A good welcome floor cover will also defend against all the debris that could be tracked in from wet shoes and boots, so it is important to consider its material and size in relation to where you plan to use and display it. Well, this doormat is just fun! It is made for all us dog-lovers and has a huge paw print in the center. These rugs have a GSM absorption rate of 3000, which is considerably higher than most competitors mats with a GSM rate of 900-1500. In this option, you will get even stitching and double basting which results in increased durability. This is the only dog specific covers that features non skid backing. This one comes in a variety of colors, including brown, grey, khaki, maroon, and pacific blue. It is machine washable and dries quickly. Having a size option for different areas in your home is a real perk for this product. It is used primarily as an indoor mat and your dogs will absolutely love it! It is thick and soft with a rubberized bottom to help keep it in place and maintain all types of moisture. The option of different sizes allows you to place these throughout your home. Not only does this adorable mat absorb dirt, mud, sand, and water, it is also great at stopping stickers, foxtails, and even pine needles. The soft material is somewhat sticky and will naturally pull these things from your shoes, and your puppy’s paws as you and they walk across and pause for a moment. The rubber backing makes it water absorbent as well and allows for a non-slip factor to keep that rug in place. 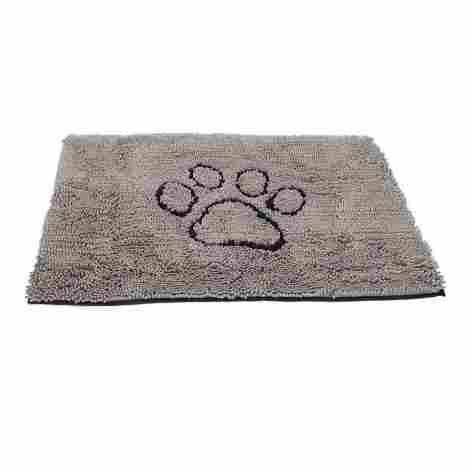 This welcome rug is also well served as a water bowl mat for your dogs. Just place it under your water dish and when those pups drip water all over it will stay in mat instead of all over your floor. Great look and multi-functional. It’s a win win! This one costs a little more than some of the others listed here. However, it is quite large, comes in a variety of colors, and is multi-functional. As always, do your research and decide what works best for you. If you are a dog lover and want something that will hold up to a lot of washing due to those dogs, this is a great choice! The paw print adds a little flare and fun and will make you smile every time you see it. The different size options are also a great addition. It is anti-slip and durable. The rubber back sticks the mat to the floor, giving it cushion and non-slippery quality. One thing I really like about this particular option is that it has an anti-bacterial surface. These mats are weather and moisture resistant and can withstand extreme temperatures, therefore stopping bacteria from accumulating on the surface. These are durable and long lasting with the highest quality polypropylene with non-porous and durable rubber backing. Also an easy doormat to clean. 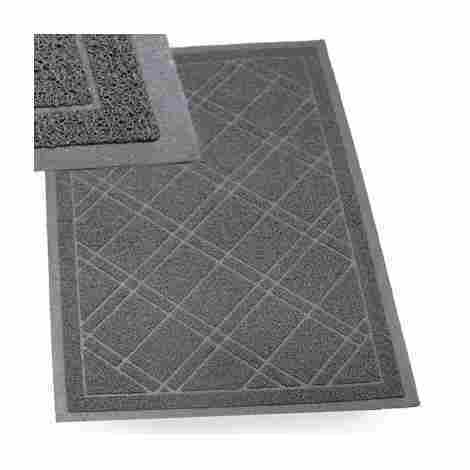 This doormat is made from the highest quality polypropylene with a non-porous and durable rubber backing. It will retain its toughness and texture, making it a great option for outdoor rugs because it will continue to capture dirt and debris, despite continued use for hours. It is easy to wash, you’ll just spray water through the fibers and the mat will be clean and dust-free. This option is very efficient in a nice, sleek design. It is small enough to fit easily underneath most standard doors, yet big enough to be welcoming. It is designed to collect the dirt, mud, and water left by the shoes and boots that cross over it even though it is surprisingly thin. 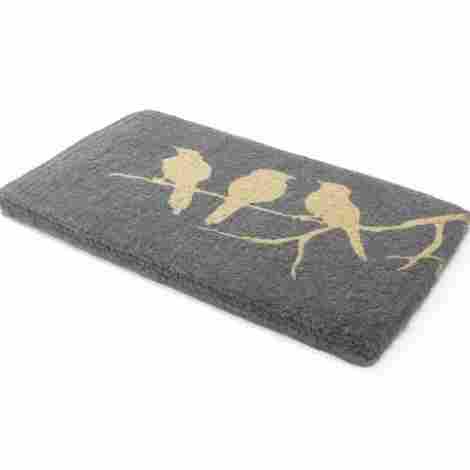 It has a nice feel under your bare feet and can be used as an indoor or outdoor mat. The design is beautiful and it throws in the extra touch of being anti-microbial. It is always nice when the product you see online perfectly matches the product that you actually receive in the mail. It arrives promptly and can be laid flat upon arrival. The size is perfect and the design is lovely. Customer service follow up is exceptional with this company. The cover is of excellent quality and exceptional value. I would definitely recommend this product and the vendor. This one is best used exclusively outdoors, but can be used indoors as well. It is your classic grassy-looking scraper floor cover with triple cleaning action. It can even hold up to a full pound of dirt! This option is made in the USA and has astroturf scraper blades that really work well at keeping the dirt outside. The color will stay strong, it is resistant to mildew and mold, and stands up well in all weather conditions. This system of the astroturf type scraper comes with rave reviews! 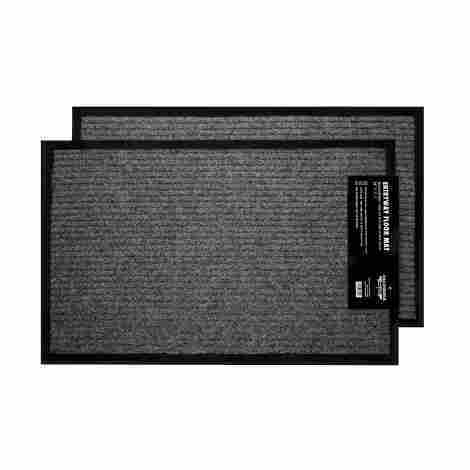 It would seem this mat captures all kinds of dirt, mud, sand, and debris which will keep your home looking much cleaner than other ones. If you have dogs who love to dig then come in and show you their prizes (and dirty noses), this one is a must for you! The rugged design is soft enough to not hurt their paws, but stiff enough that they won’t want to pick it up and drag it out on the lawn. This mat will stay put for both humans and their pet friends. It is also great to lay in front of your kitty litter box, as it is a lot less expensive than rugs made specifically for that purpose, but will function just as well! The clean machine scraper design is incredibly efficient but not painful to walk on. Truly, one of the most important aspects of any good rug is how quickly and easily you can clean it. This one is incredibly easy and will make you want to buy them again and again, for every door in your house! They hold up to one pound of debris per week, which is an incredible amount. Just get in the habit of shaking it out really well once per week and hosing it off every couple of weeks. The astroturf design and color will not fade, so as long as you keep it clean and debris-free this doormat will last you a very long time. This doormat is a great purchase! It is very reasonably priced, durable, fade resistant, and effective. You could easily buy one for every entry to your home and save a lot of money in maintaining your floors. It does come in three different colors so you can add a little of your own flare when decorating. It works in all weather conditions so there is no need to change it out for the different seasons it will encounter. It is incredibly easy to clean and will serve a myriad of purposes. If you’re looking for inexpensive and effective all wrapped up in one, this would be the perfect option for you! This beautiful, welcoming Welcome rug is a front door essential! Guests will feel your warm welcome when this option graces your entryway. It is made of coconut husks that are incredibly strong and has a vinyl backing which helps it to stay put. The strong bristles wipe away mud, dirt, and snow from your shoes, which effectively works to keep your home that much cleaner. It is also easy to clean - just shake, sweep, or vacuum and it is as good as new! With Welcome rugs, the medium is the message! You want something more than just to wipe your feet on. You want to “welcome” your shoe-wipers from all walks of life, during all seasons. You want inclusion, warmth, and sincerity of an open-door policy. But, let’s all face it, you also need a floor cover that is functional, because if it’s just cute and still lets in all the dirt, you have defeated the purpose. This one definitely does both! 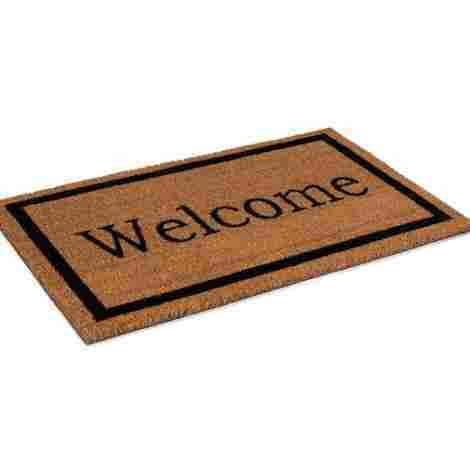 Made of tough and durable coconut husk and backed with vinyl, this one will gather all the debris and still deliver the message: Welcome. Come on in, we are glad you’re here! Unlike most of those rugs, this option does not come folded or even rolled. It is packaged flat, in a large, thin box so you are able to take it right out of the box and lay it on the floor. No need to let it relax in order to lay flat. It arrives quickly, in good condition, and is ready to use. The material is strong and will last for a long time. It comes in the 18”x30” standard size, or the 24”x36” oversized floor cover, so can be custom ordered to fit any entryway. This one is very cost effective. It is made of high-quality materials, heavy duty, and durable. It can be custom ordered to say a variety of things so you can bring a smile to your visitors before you even open the door. 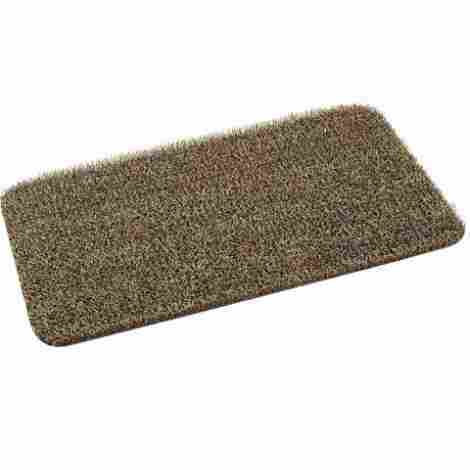 It gathers the debris and is easy to clean, so you are definitely getting your dollar’s worth with this welcome rug. This floor cover that has an exclusive plaid duraloop design that will look great in any home! It is anti-slip and durable, has a weatherproof surface and is easy to clean. This one is a little larger than some, so make sure you check the area you are planning to put it. This one measures at 42 inches by 36 inches. Made of soft polypropylene fiber which is waterproof and moisture resistant. I really do like to be able to choose a color for my liking! This floor cover does come in three neutral colors - black, brown, beige, and gray. Whether you use it inside or outside, I always enjoy being able to splash a little of my personality through the color of the mat. It is soft on your bare feet but still scrubby enough to catch the dirt, making it nice to wipe your feet. The Duraloop design gives this rug a unique look that will look great anywhere. This rug is thin enough to use anywhere and will not get stuck underneath your door. You can use it on your patio, in the garage, in the laundry room, or in your entryway. It provides a good cushion and is non-slip at its finest. It will capture the debris tracked inside and is moisture resistant. The duraloop design makes it easy to wash and durable enough to last for years. You definitely get your money’s worth with this welcome rug! It is a good looking option that is versatile and can be used indoors or outdoors and will complement any room in your home that just needs a little flare. It is great for shoes, boots, and even muddy paws as your dog comes barreling through the door! It is stiff enough to capture the debris and moisture, but soft enough to walk on with bare feet. This is a nice mat that is cost effective and will serve its purpose. This rug is sure to keep your floor clean with the ribbed polyester. It functions well to remove dirt and mud from your shoes in addition to absorbing moisture. The non slip back is made of a heavy duty rubber that keeps it where you want it to be and it offers great protection from rain or snow by stopping water seepage. It is reusable and easy to clean, much thanks to the polyester’s durable nature. All you need to do to clean this mat is shake, vacuum, or sweep it off and if needed, clean it further with the hose and then let it dry. The fabric is strong, doesn't fade, and will withstand even extreme weather. It will make a perfect mat for all of your shoes, both inside and out. This mat is nice and thin and door easily open and shut over it. It works well for home or businesses even with the heaviest of traffic. The polyester makes it incredibly durable and easy to clean. Color won't face and the fabric will last for years. It is biodegradable and made of recycled rubber and recycled plastic. This is an excellent pack of floor covers for the price. They are durable and long lasting, made of recycled and biodegradable material, and easy to clean. Not only that, but you can also benefit from a lifetime guarantee thanks to the manufacturer. You can reach out to them with anything you need and they will help settle your concerns. 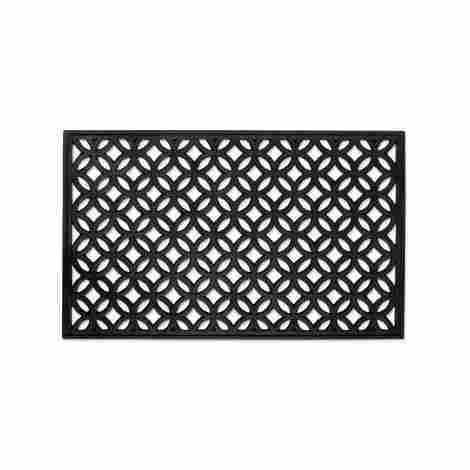 The Iron Gate Gatekeeper welcome rug has a few color selections, all of which come with a rubber black border. It has a raised ridge water dam design, which captures debris and water. It also minimizes the risk of slip and damage to the floor. The ridged design helps it to store moisture and dirt below the level of your shoes so it isn’t tracked in by the next person to come through your door. It is easy to clean thanks to the rubber backing which also happens to be made of recycled material. 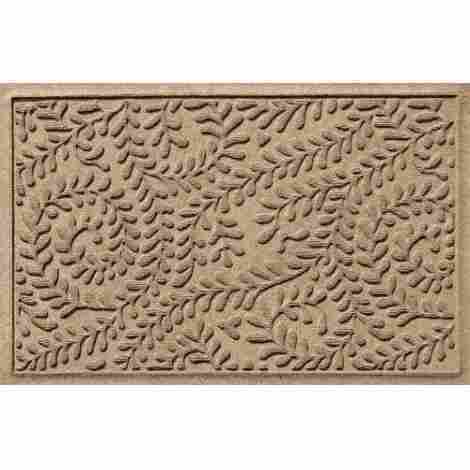 This water dam design shows the rubber edging of the doormat to be slightly raised from the rest of the rug. This way dirt, debris, and water are all stuck inside it itself. The ridged design of the floor cover also helps to contain all of the things that get scraped off your shoes and onto it, beneath your shoe level. They are very easy to clean and will serve their purpose most effectively when they are clean, so remember to take the time to do that! Alright, so back to the fact that I really like to be able to choose my color! This one does come in a variety of colors to choose from, and you can also choose from a selection of welcome type phrases on the rug. This option is also thick and somewhat heavy, which helps it maintain its grip on the floor and not move around. It comes in several sizes so you can also choose different locations inside and outside your home where you would like this mat to be. These are great quality pads and live up to all they claim. They capture dirt and debris quickly, hold water, stay in place, and can either blend in or stand out, depending on your color choice. They come wrapped very tightly in shipping so take a little while to flatten, but the quality will be more than you’re hoping for and will last for a really long time. For the reasonable price, you’ll pay for this one, I am quite sure you can’t find a better deal! These floor covers are extra thick for increased durability, biodegradable, compostable and come in many unique designs that will captivate your guests, show off your own personal flare, and create an elegant entrance to your home. On top of all that, they are remarkably easy to clean! When you research this item on your own, you will find over 30 (30!) design options! There are several different color options and say things like: Home, Hello, Faith, Hey Ya’ll, OMG, or have different designs, beach prints, floral designs, a crab, a picket fence, and on and on. I just love being able to have so many choices! They are all extra thick rugs for increased durability. Water based pigment paint is used in the design and these mats are all a handwoven construction, biodegradable, and compostable. One of the most important aspects of a quality floor cover is that you can clean it quickly and easily. You want your rug to retain water, but you also need to remember to empty the water on a regular basis in order to maintain the vibrant colors and dirt collecting design. To clean this rug, just scrape the dirt and mud off with a brush and then you can pick it up, shake it, and drain out the water quite easily. The price on this option is quite economical, especially when you consider all of the different options. It is extra thick and durable so you will not have to replace it for years to come. The shipping is great and can easily be given as a gift without having to rewrap it. It lays flat upon arrival and is quite a conversation starter! Whatever color or design you choose with this option, you will not be disappointed. This option measures 2 feet wide by 3 feet long, and is ⅜” thick. It is commercial grade, anti-static, quick-drying, and will not harm any type of floor surface. It is safe and skid free on any floor and can be used indoors or outdoors. It can hold an incredible amount of water, with its exclusive “Water Dam” design. It has a ridged geometric design and rubber border to keep water and debris on the cover, not on the floor. It has a polypropylene fiber face that will not mildew or rot. The high quality construction can stand up to extreme elements, and the rubber backing is eco-friendly. The Waterhog welcome rug comes in a variety of colors to match your own personal preference. Classic Bluestone, medium gray, and charcoal are nice neutral colors that will match about anything. Dark green, evergreen and khaki/camel colors are a nice switch up that will add a nice accent color to your entryway, inside or out. All of the colors are 100% USA made, premium construction and quality. The rubber backing is eco-friendly, made of 20% recycled SBR rubber. This is an excellent cover, especially for coming in out of the rain. The water dam design holds up to 1.5 gallons of water per square yard of fabric! The geometric pattern featured here has a rubber border that helps to keep your floor clean by accumulating both water and debris. They hold up extremely well and clean up nicely. They really don’t show signs of wear, even after years of use. This floor cover is not very thick so it lays nice and flat and doesn’t get in the way. First impression may lead you to believe this option is a little pricey. Do your research, though, and you will find that this doormat actually features a lot of cutting-edge technology that will make your purchase worth every penny! It works well inside or outside, is just the right size and height, holds in all the dirt and moisture and cleans up like a breeze. Really, could you pour a gallon of water on the one you use now? Those perks and the fact that you can choose your color make this option the one that should be on your doorstep! You can be sure to keep the dirt and debris outside with this unique hot cover ridged construction. It helps trap the dirt and moisture to keep floors clean and safe from accidents. This material and design is perfect for wet conditions. 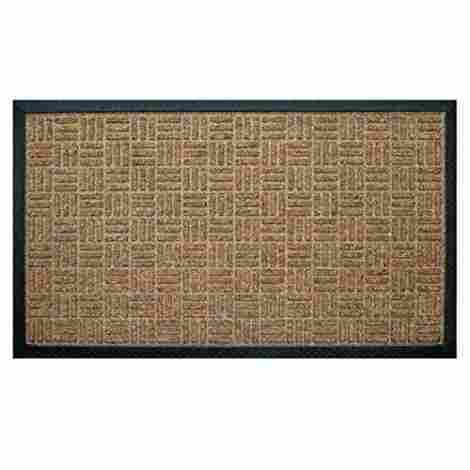 The polypropylene fiber hog ones dry quickly and can be used for your entryway, mudroom, laundry room, patio, or garage. To clean, you'll just hose them off with water and hang to dry! Color matters! What better way to throw out a piece of your personality when guests arrive at your door? This item comes in six different colors so you can choose whichever one suits you the best. All of the color options have the hog rug ridged construction which will trap dirt and moisture to keep your floors clean and unscathed. One of the great things about this option is that it is not only an incredible asset for your home, but it can also be used commercially, in warehouses, restaurants, office buildings, and various other high traffic industrial locations. It is comfortable enough to be used at home and durable enough to be used in a much more extensive situation. No matter where you choose to lay this rug, it will not let you slip! When compared to other, pricier options, I think you will be very pleased with the price of this highly functional floor cover. The color is vibrant and it is remarkably easy to clean. It is awesome for hardwood floors and collects the dirt that is tracked in from the outside. It is packaged in a flat box which allows it to be laid out on arrival with no worries of rolling or curling on the edges. It is a quality product, works well, is very sturdy and looks great! Where Will This Cover Go? One of the most important things to consider when choosing your floor cover is where you plan to use it. Will this be an inside or outside floor cover? If you want one for outside, it is critical that it be weather resistant or it will wear out much too quickly. Rubber is great at handling the elements. There are other materials that also work well outside and come at a lesser price, though you should take your particular climate into consideration. Outdoor covers should also have abrasive surfaces to help scrape dirt and mud off your shoes and a thick bottom really helps it hold up in the weather. For the ones that you want to put inside, heavy duty is less of a priority and you can go for something more aesthetically pleasing instead of mostly functional. They are mostly made to trap dirt and dust found inside instead of mud and the volume of dirt found outside. Let’s go over a few more things that need to be considered before making your purchase. Is This Floor Cover Easy to Clean? Something that you don’t always think of is cleaning welcome covers. Logically, it accumulates all the mud, dirt, moisture, and who knows what else from your shoes so it is going to end up very dirty. As such, you want your welcome cover to be very easily cleaned. This is even a bigger deal if you are getting one with a pattern as it is likely to be covered sooner rather than later. Designs really only last a couple years outside at best, which may or may not be a problem, but should be in the back of your mind. Inside is a different story – you can get away with a lot more there. Something else to keep in mind is that a light cover will get dirty much faster than a dark one. If you keep a very clean house, this may not be an issue, but if you tend to get a little dirty (I’m looking at you parents of both human and animal children) then light may not be the best idea. The best floor covers are easily cleaned by shaking, vacuuming, and maybe even spraying off with the hose. You don’t want it to be much more intense than that because then it just becomes too time-consuming and not worth your effort. It is always fun to welcome your guests in style! While you’ll want something to reflect your own personal style, you still need to opt for one made out of a durable material. In a perfect world, your welcome floor cover will be an extension of your indoor decor and most are designed that way. However; they have to made specifically for outdoor use so that they will trap all the dirt and debris before it comes in the house. Nobody wants that inside. There are many different options of material in an outdoor rug. One of the best, in my opinion, is the water dam with ridged contours. This design will scrape the dirt off your shoes and allows it to fall between the ridges below shoe level, so the next person who comes in doesn’t step on your dirt and bring it in the house anyway. This design also holds the water inside it so it doesn’t leak all over your entryway. When you have a cover that retains water, it is important to remember that it will not drain itself! You will need to take the time to drain it occasionally, especially if you are in a very cold area where it could ice over during the night. For indoor usage, you will want one with a rubber or vinyl back so that it won’t slip or slide. Acrylic is a great option for the top of it because you can simply shake it off or vacuum it to remove the dirt. To best coordinate with the style of the rest of your home, opt for one in the same color scheme just darker. Darker colors will hide the dirt better but still look good. Q: Does this outdoor rug dry easily? A: It will dry within a couple of hours hanging up in the sunshine. Q: How does the rubber backing stick to concrete floors? A: The cleated and rubberized backing will hold in place on various surfaces. You can also apply double-sided tape to the back of your cover to ensure the security of your welcome rug. Q: Is this rug abrasive on bare feet? A: Most outdoor rugs are more abrasive than plush. However, most of these covers are not abrasive enough to scratch your bare feet. Q: How easily can this welcome rug be cleaned? A: Most indoor carpets can be vacuumed just like any other rug or carpet. Because of the rubber backing on most outdoor rugs, you would want to spray it with a hose and a small amount of liquid soap, then just allow it to air dry before laying it back on the ground. Q: Does the rubber backing smell of petroleum? A: Your floor cover will likely have a minimal smell of rubber upon arrival. Once laid out and allowed to settle the scent will dissipate and have no smell at all. Q: If I use a robot vacuum on my floor, are these floor covers going to stay in place or get stuck with the robot? A: This will depend on how aggressive your robot vacuum is. In most cases, the anti-slip backing will hold the rug in place through a vacuum. 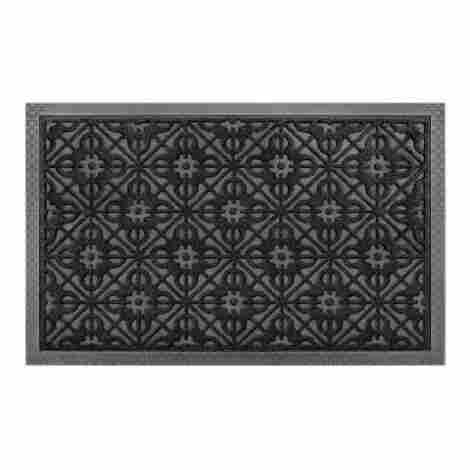 WiseGeek, What Should I Consider When Buying a Doormat?